This year we are proud to support the Cystic Fibrosis Trust. All proceeds will go to the charity! Hundreds of runners and spectators gathered at the Wrekin on Saturday for the 4th annual running of the Wrekin Relay challenge hosted by Wrekin Road Runners. Teams of three, made up predominantly of local club runners competed against each other to win prizes in the categories of male, female and mixed teams. The athletes set off at 2pm on the 3.8 mile loop of the Wrekin, taking on technical decent and two significant lung busting climbs, one half way through the route and the other killer climb up to the handover point. Competitors tagged their teammates before gathering their breath to receive a bespoke medal, a memento of the race. Eventual winners in each category were Scott Hall, Carl Aveyard, Dom Jones representing Mercia Fell Runners and Shrewsbury Athletic Club in the male category, in a time of 1 hour, 13 minutes and 10 seconds. The ladies spoils were taken by Julie Jones, Amy Aldridge and Lauren Poole from Lawley Running Club in 1:41:03. Finally the mixed team again was from Lawley, winning in 1:24:21; a team made up of Craig Jones, Louise Morgan and Dan Turner. The race has been popular since its inception in 2014 and this year proved no different. Louise from Team Evolve said: “As a competitor, the race ran like clockwork and the support from the marshals (and spectators) on the course was superb! Well done and thanks to all involved!”. The race also raises money for the Midlands Air Ambulance, a service that is solely funded by charity donations and wouldn’t exist without the various contributions from individuals and sporting events. Each competitor will run a 3.8 mile lap around the Wrekin. By entering the race, entrants declare that they are medically fit to compete. Please do not enter this race unless you are medically fit to compete. It is your responsibility to ensure that you are fit. From Shrewsbury, On the M54 go off at Junction 7. Turn right to the Wrekin - 1 mile to car park. There is a free car park in addition to the Wrekin car park. Please use this for minimum disruption to local traffic and other visitors to the Wrekin instead of the Wrekin Car Park. Please look out for the signs. Please can you all consider car sharing to reduce our carbon footprint. Registration is a 10/15 min walk from the car park. Registration opens at 12.30 hrs and closes at 13.45hrs. Race numbers should be collected from Registration on the day. This is an important safety feature – it means that we know who is competing on the day. Please write your name and emergency contact detail on the back of your number. Please add any important medical details. All runners must wear a number securely pinned to the front of the vest/T-shirt, numbers not to be cut, folded or mutilated. You will need 4 pins to make sure your number is securely attached. We have no baggage storage area. The Half Way House will supply cold drinks and ice creams. Post Event Massage will be available for a donation to charity. The route is fully marshalled. The route is of undulated paths and tracks. There are plenty of tripping hazards – you will need to be alert at all times during the race. There is also one style to pass over. Please be aware that the course is open to the general public so please beware of cyclists, walkers, other runners and dogs. The course will be marked and have marshalls at key points. Please note that NO head phones, ear pieces will be allowed as you need to aware of your surroundings and to be able to hear marshals instructions. We intend to supply water half way round the route. Each runner will receive a bottle of water on completion of their lap. If you need water for your race please bring some along. Please be mindful of littering and only dropping bottles near to marshal points. Handover will be via tagging a team mate. Your leg time will be recorded upon tag. Please stay in line in order of completion. There will be an official on site to ensure this is done correctly. Once handover is complete each runner will move down the funnel for number recording. Once you have collected your number from Registration it is expected that you will complete the course and pass through the finish funnel. If you find for any reason that you cannot complete the race you must report to the nearest marshal. This is an important safety feature – we need to know that all runners are accounted for at the end of the race. It is the responsibility of each runner to comply with this requirement. We don't want to be searching for a runner in the woods or on the open hill who has retired from the race and gone home without letting us know. We will allow the other members of your team to do their leg but unfortunately you will not be counted towards the team prizes. Limited results will be available on the day. Full results will be available from the website above. We hope that you enjoy this race and thank you for supporting the The Cystic Fibrosis Trust. If you enjoy a bit of off road running combined with lovely scenery (and maybe a few bumps!) 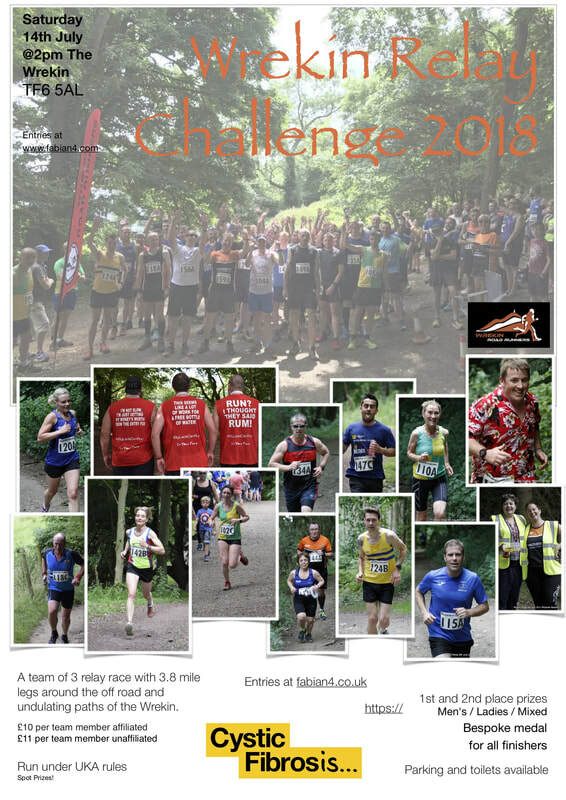 why not sign up for our other great event The Apley Estate Autumn Challenge? there's a choice of distances to suit everyone, all set in the scenic private estate of Apley. Technical T-shirt, bespoke medal and goody bag for all finishers! To find out more go to http://www.wrekinroadrunners.net/apley-estates-autumn-chall… or find us on Facebook. We look forward to seeing you there!